Halloumi salad recipe for a hot Friday night | WTF Do I Eat Tonight? England’s seasons seem to be shifting. I’m typing this outside, on an evening worthy of June or July rather than early May and as London swelters other parts of the country are literally burning: there are forest fires in Wales! So whereas once upon a time December was cold but not snow-cold, and August was summer not autumn, now we’ve had snow two Christmases running and August tends to be a bit damp and grey. So, rather than on-the-cusp food, hot dishes that are a bit spring-like, I need salads. Not just some green leaves, but something full-on that can be a meal or a starter and which requires very little heat in the kitchen. 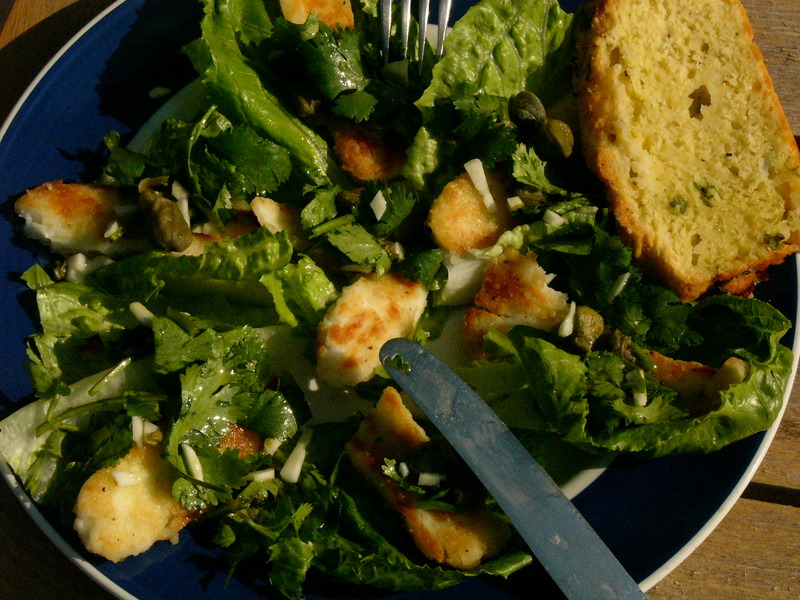 This halloumi salad comes from Delia Smith’s Summer Collection, a book I’ve already used this week. I’ve only ever made about four recipes from it, but they are four that I come back to often, especially when it’s warm. 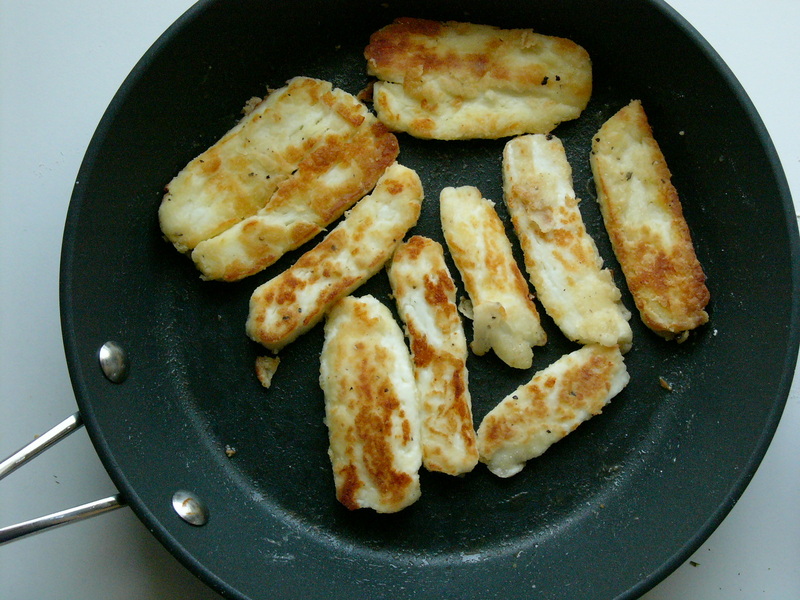 This is ridiculously simple and delicious and, since you can now get halloumi in my Tesco’s Express, you should be able to find it anywhere. 1. Slice the cheese into eight pieces. 2. 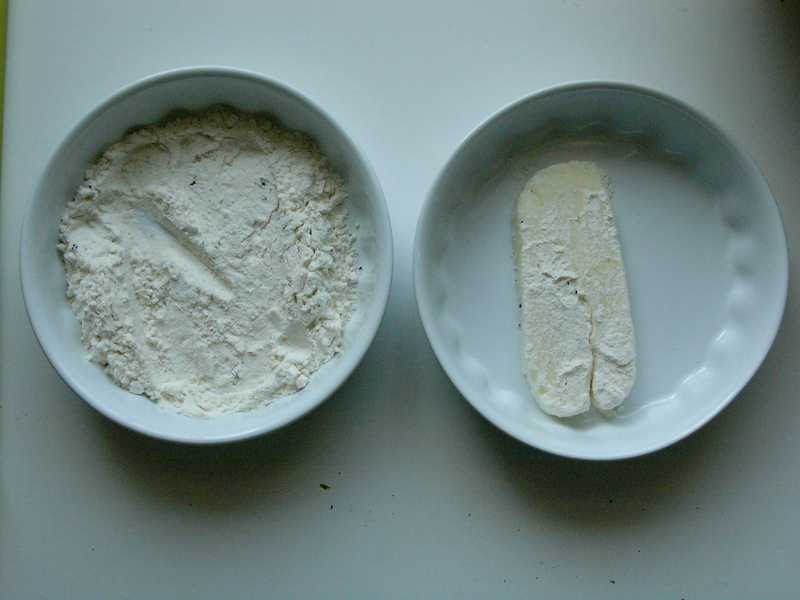 Season the flour with salt and pepper and put it in a shallow dish big enough to dunk the cheese pieces in. 3. Make a dressing with the zest and juice of the lime, vinegar, capers, chopped garlic, two tablespoons of the olive oil and one tablespoon or so of the coriander leaves (keep some back for a garnish). Season and leave on one side. 4. Dunk the cheese slices in the seasoned flour so that they are well-covered (I have often omitted this step and just fried the cheese naked as it were; it’s still good). 5. Heat up the rest of the oil in a shallow frying pan and fry the pieces of cheese on both sides until they are crisp and brown. The recipe says this will take a minute each side but I’d say it takes a bit longer, depending on your pan. 6. Serve the cheese with the dressing poured over and a handful more coriander leaves. Glorious sunshine food. 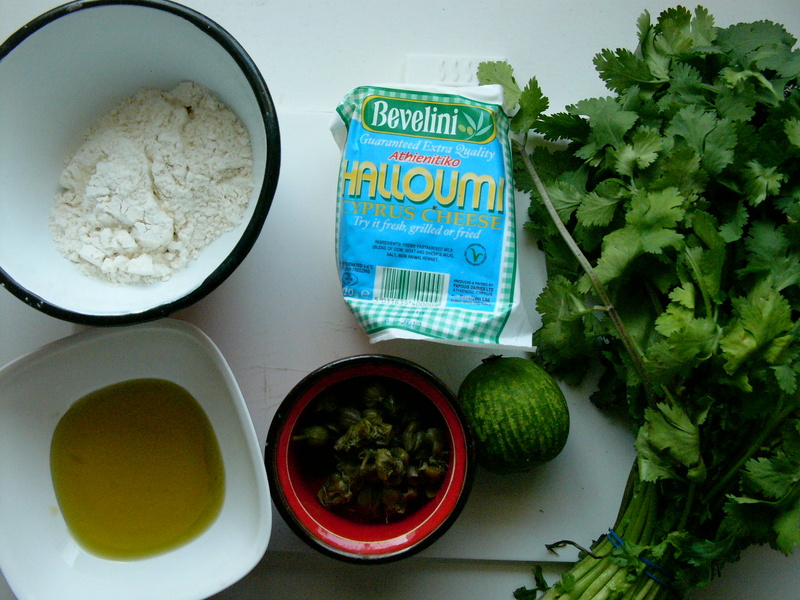 This entry was posted in Salad recipes, Summer recipes, Vegetarian recipes and tagged Delia Smith's recipes, halloumi recipes, salad recipes, summer recipes. Bookmark the permalink.